Mass transit is becoming more important in cities and suburban areas worldwide. New generations of vehicles equipped with newly designed drive systems have entered service in recent years. 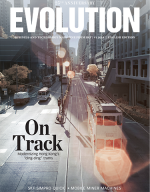 Mass transit systems are enjoying a revival in cities throughout the world. 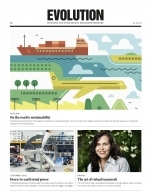 Modern transport systems demand efficiency and reliability. Suppliers of such mass transit systems have to live up to the exacting expectations of their customers. They are expected to offer everything from engineering and maintenance to project financing. ?? ?At the same time, transport system manufacturers have to meet the ever-changing needs of the marketplace. This means that mass transit system design is constantly evolving and introducing innovative features to suburban trains, metros, undergrounds and tramways. ?? ?One feature of the new designs is easy access, offered by low-floor vehicles. These designs are technically very challenging because of limited space for the drive system. SKF, in collaboration with major suppliers such as Adtranz, has developed completely new bearing solutions for axles, independent wheels and new drive system principles, including applications where the wheel is integrated in the traction motor design. Railway operators are interested in highly efficient and reliable railway systems. Moreover, providers are expected to offer everything from engineering and maintenance to project financing while meeting the changing needs of a shifting marketplace. As a result, successful innovations are key factors to profit and survival in the railway industry. Innovative suburban trains, metros and undergrounds and tramways have been developed. Low-floor vehicles, which can be entered easily, play an increasing role. These designs are technically very challenging, because the lowered floor limits space for the drive system. SKF, in collaboration with major suppliers such as Adtranz, has developed new bearing solutions for axles, independent wheels and new drive systems, including applications that integrate the wheel into the traction motor design. Adtranz is a leading global provider of railway services, systems and rolling stock. Founded in 1996, Adtranz operates under the legal name DaimlerChrysler Rail Systems and employs about 22,000 people worldwide. The company offers total rail systems and service, people movers, tram and metro systems, commuters and regional trains, intercity and high-speed trains, electric and diesel locomotives, signalling and fixed installations. Adtranz is represented in 64 countries. It manufactures in 19 countries, has legal entities and branches in 40 countries and employs about 24 agents worldwide. In 1999, the Group reported revenues of approximately 3.6 billion euros. Drive systems for railway trains have to be powerful, environmentally friendly, cost-effective and require very low maintenance. These requirements are much more stringent than those required of cars, for example, because the intervals between servicing are much longer. 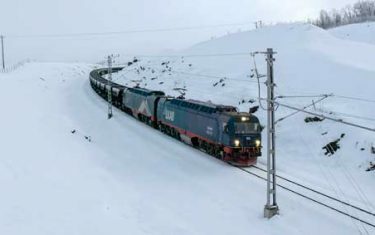 New main line locomotives are maintained frequently, but main service is done after the locomotive has logged between 1 million and 1.5 million kilometres. These locomotives operate, on average, up to 1,000 kilometres a day. Adtranz’ propulsion product unit is based at Wiener Neudorf, close to Vienna. This centre of competence has a long tradition in drive system design. Today it is responsible for the development, design, sales and marketing of propulsion systems for all types of railway rolling stock. For more than 20 years, a novel generation of liquid-cooled three-phase asynchronous (AC) traction motors has been manufactured. As cooling liquid, the design employs water with anti-freeze and corrosion inhibitor additives. One main application is in mass transit vehicles. Low mass and low space requirements because of high speeds. Low maintenance because of a completely closed design. Ability to contribute waste heat for vehicle heating. Absence of ventilator filters and air channels. Drive systems in railways are used to transmit the torque on the traction motor, usually operating with higher speeds, to the wheel set via a gearbox. The number of gear steps depends on the maximum speed of the traction motor and the vehicle. Normally, locomotives equipped with air-cooled traction motors with a power rating of 500 up to 1,700 kW use a one-step gearbox with a ratio from 3 up to 5. 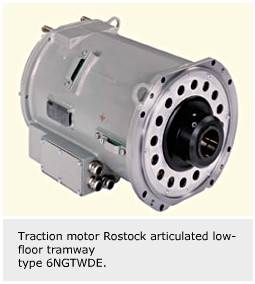 For mass transit vehicles, air- and liquid-cooled four-pole traction motors with a power rating from 60 to 200 kW are used. The maximum traction motor speed is 6,000 r/min, which refers to a supply frequency of 200 Hz. In this case, one-step or two-step gearboxes are used. Two-step gearboxes are designed for ratios from 6 to 11. State-of-the-art drive systems consist of two separate components, the traction motor and the gearbox. The traction motor usually is equipped with two bearings supported in the motor shields. On one side of the shaft, a pinion is mounted to transmit the torque. To meet the new requirements, a complete new design was developed. An input shaft drive system with a three-bearing arrangement is applied. The drive shaft of the gearbox is supported with two bearings. A membrane coupling, which is flexible in bending but stiff against torsion, connects the traction motor, which is equipped with one bearing on the opposite side. The coupling is made of fully metallic materials, with no rubber elements. The output shaft drives, via elastic coupling, a hollow shaft, which is connected to the wheel set with a second elastic coupling. With this specific design, no additional dynamic loads can influence the drive system. 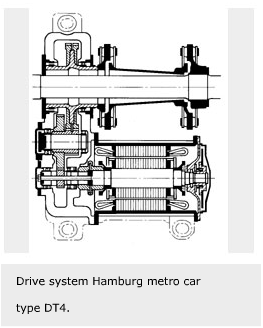 The first application of this new drive system, equipped with liquid-cooled three-phase traction motors, was carried out for the DT4 cars of the Hamburg metro system called the Hamburger Hochbahn AG (HHA). For this application, the fully suspended drive concept was used. The bearing arrangement is based on the three-bearing concept. On one side, the traction motor shaft accommodates a special cylindrical bearing based on a NUB 212 ECM. The NUB design consists of a NU design outer ring with two integrated flanges on both sides and the cage with the roller set, and an inner ring, which has a much wider design. This offers a larger possible axial displacement, needed especially for the mounting procedure. The bearings are equipped with a roller guided brass cage and a C4 radial clearance. In total, 800 traction motors are in service at Hamburg and at Vienna, where a very similar design is used. The bearings are designed to operate up to 3 million kilometres or approximately 25 years, assuming 120,000 kilometres per year. The main service interval depends on the wear of the wheel tyres. Service intervals up to 1.5 million kilometres are achieved. 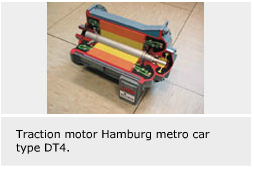 Traction motors used at the Hamburg metro system are maintained by relubrication of bearings. This can be easily done in the depot as an under-floor service. Grease is distributed and the quantity regulated by a rotating disk. First relubrication after 600,000 kilometres. Second relubrication after an additional 500,000 kilometres. After an additional 400,000 kilometres, the main service interval of 1.5 million kilometres is reached. During this service, the drive system and bearings are dismounted. To confirm this procedure, some grease-lubricated traction motor bearings are inspected every 150,000 kilometres, after 450,000 kilometres is reached, to investigate grease properties in detail. The last inspection was done in 2000 after more than 1 million kilometres of operation, and the results confirmed the applied maintenance routine. Hamburg has 86 trains, each with eight traction motors in service. The total mileage of these trains is close to 400 million kilometres, which is equivalent to travelling 500 times from the earth to the moon and back. A medium-term task is to apply new reinforced greases and seals to avoid field lubrication. The drive system principle used for the Hamburg metro cars is applied in a similar way for several low-floor tramways. One design concept is to design 70 percent of the total vehicle length with a low floor and the rest with a higher floor level to accommodate the powered bogies. The new drive systems from Adtranz are in operation at several tramways in Germany, including Bielefeld, Darmstadt, Erfurt, Essen, Freiburg, Heidelberg, Karlsruhe, Leipzig, Ludwigshafen, Magdeburg, Mannheim and Rostock, as well as at Antwerpen – De Lijn, in Belgium. Varying the active iron length of the rotor and stator can alter the maximum motor torque and power rating of 65 up to 127 kW. This design principle allows the use of the same bearings and bearing shields, as well as the same shape of iron sheets for rotor and stator. The basic design of the traction motor bearing is similar to the traction motors used for metros, only the dimensions are smaller and the size is according to NUB 210 ECM. One application example is the Rostock articulated low-floor tramway design. The tramways at Rostock operate about 55,000 kilometres per year. The relubrication intervals are 350,000 kilometres, or approximately six years. First relubrication after 350,000 kilometres. Second relubrication after an additional 250,000 kilometres. Third relubrication after an additional 200,000 kilometres. After an additional 100,000 kilometres, the main service interval of 900,000 kilometres is reached, which corresponds to 16 years service or two 8-year general overhaul periods, as specified by the German railway control board. More than 2,500 traction motors of this design principle have entered operation since 1994. A radical simplification of the total drive concept can be achieved by using the hub traction motor concept based on a direct drive system. In this case, the traction motor directly powers the wheel and acts as wheel support and guidance without any gearbox or coupling components. 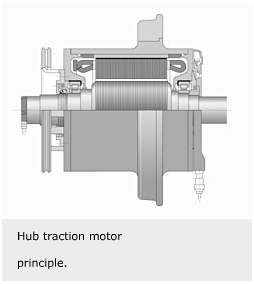 The liquid-cooled traction motor is designed with a stator inside. The outside rotor directly powers the rubber spring-suspended wheel tyre. This space saving arrangement is especially suitable for 100 percent low-floor tramways, which have a plain floor without any steps or ramps. The stationary axle is equipped with integrated cooling coils to cool the stator. The stator iron shields are fitted directly onto the axle and fixed axially on both sides with special shrunk rings. The stator coils are powered with electric wires, which are connected to the vehicle with a special connector unit. In the housing, an earth brush and an earth ring are accommodated. If requested, a brake disk can be flanged onto the hub motor drive system. The bearings have to support additional dynamic loads during operation, such as track failures or shocks from travelling through points and crossings. Two cylindrical roller bearings are applied. As locating bearing, type NUP is used, and as non-locating bearing, type NU is used. Each bearing is equipped with a mixed guidance one-piece brass cage-type MRD, guided from the rollers during standard operation conditions, and additionally guided from the outer ring shoulders during dynamic shock condition. 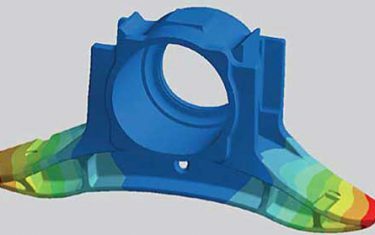 This specific design feature requires close manufacturing tolerances, which can be achieved by using the new SKF form-turning technology. The radial clearance is specially chosen for this specific application. Both bearings can be relubricated, if necessary, and are protected against contamination and grease loss by double labyrinths. 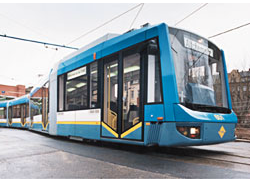 The first prototypes were tested in the articulated low-floor Variobahn tramway, operating at Chemnitz in Germany, where the first serial vehicles were later ordered. 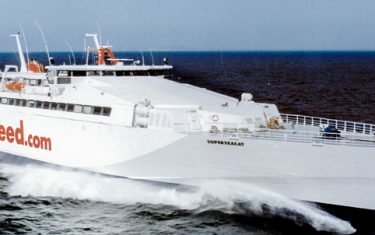 Similar vehicles are also operating at Duisburg, Helsinki and Sydney. More than 500 hub drive system traction motors are in service. To reduce maintenance operations further no field lubrication is requested more and more. As a medium-term target, no relubrication up to 1.5 million km should be achievable. However, to reach this target depends very much on the specific operational conditions. Advantages can be gained by using new grease technology and closed bearing unit designs like the TMBU traction motor bearing unit. In this case pre-lubricated and ready-to-mount units can be flanged directly into the motor shield.